Maui was legendary Māori singer/producer Dalvanius’ first name; he was christened Maui Dalvanius Prime. Tagging his new label with that name, he described its as “A Māori Motown” to both the Auckland Star in 1982 and RipItUp. Maui was never to reach those lofty heights, but in 1983, the label released one of the most enduringly popular and ground-breaking records of the 1980s and beyond – The Patea Maori Club’s No.1 chart success ‘Poi-E’ – a song that was written by Dalvanius with famed composer and Māori language advocate Ngoi Pēwhairangi. In the late 1970s and early 1980s Dalvanius was working with Mascot Studios and Warrior Records owner Hugh Lynn on a variety of projects including the 1982 No.4 novelty hit ‘Maoris on 45’ by The Consorts when he first envisaged an all embracing Māori record label focusing on Te Reo recordings. It would be a label that would both empower and dig deeply into the vast pool of Māori talent in a similar manner to the way Berry Gordy’s 1960s Detroit labels worked with black talent in Detroit. Lynn offered Prime cheap studio time, making the label viable, and WEA’s Tim Murdoch offered both a distribution deal and marketing support, and the label was established in late 1982. ‘Poi-E’, a record made with The Patea Maori Club from the small Taranaki town ravaged by the closure of its only large employer (the meat works) was released in late 1983 as the first release, but it wasn’t until the end of the year it began to sell in any numbers. Despite radio largely ignoring the release, it slowly gathered momentum as the public took to it in increasing numbers, helped strongly by a featured story on TV One's Eyewitness News, and after five weeks in the Top 10, it hit No.1 in March 1984. The song would remain in the New Zealand Top 40 for six months, of which four weeks were at the top. It was another slap for radio in New Zealand, which continued to largely ignore the release in the main centres, with regional radio proving to be the key airwave outlet. Written by Ngoi Pēwhairangi and Dalvanius, ‘Poi-E’ was not only the biggest selling single in New Zealand in 1984, it also successfully fused together the urban sounds that were increasingly dominant in New Zealand’s cities with Te Reo, thus providing a landmark that would change the way music was made by young Māori and absorbed by all New Zealanders thereafter. 'Poi-E' would also be named as Single Of The Week in the notoriously hard to impress UK magazine, NME. Further releases on the label from The Tama Band, Moana (later of The Moahunters, who would find sales and critical success at Murray Cammick’s Southside label) and Mika, plus an album and several more singles from The Patea Maori Club followed. None, however, had the success of that phenomenal debut single. 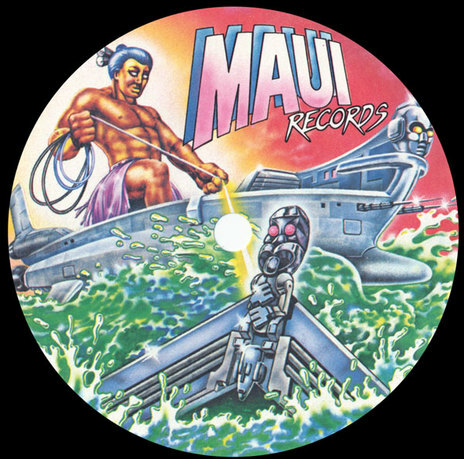 Maui as a label ceased issuing new records in 1990, partially because Hugh Lynn was winding down his recording activities, and thus the promise of a Māori Motown was destined to remain unfulfilled, although Dalvanius' dream to redefine New Zealand pop forever was surely realised with 'Poi-E' now regarded as a landmark recording. The catalogue is now administered on behalf of Dalvanius Prime's estate by Jayrem, and a remastered extended 25th Anniversary edition of the Patea Maori Club album was issued in 2009.